We all stood still, concentrating furiously to see if we could hear this rare and obscure creature. It was difficult to catch it and after about thirty seconds, John continued, more rapturously. But still, none of us could hear it, however hard we tried, however quiet we were. Eventually someone asked him what he was listening to. There was something of the Gandalf about John, a little anarchy mixed in with the faith, some mischief with the love, a hint of magic even when you had no idea what he was on about. He looked at you as if he knew something you didn’t and he usually did. A Baptist minister, he was one of the visionaries behind the emergence of the Greenbelt Arts Festival and of College House, which, thinking about it, was a kind of philosophical/theological forerunner to wholistic how-to-live-a-good-life kind of organisations like The School of Life. 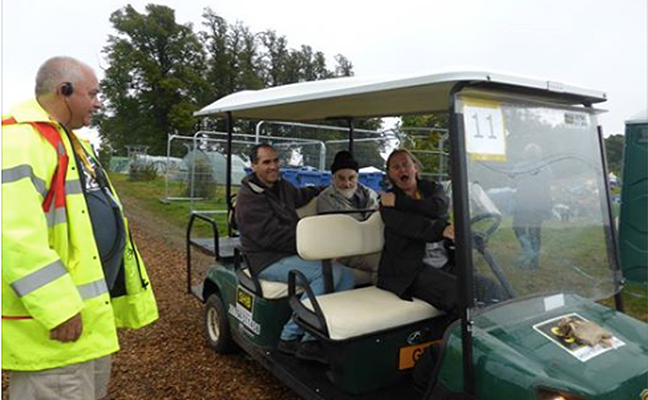 In this photo, taken when John was ninety, the last time he visited Greenbelt a couple of years ago, I had just explained to his driver that without John, none of us would have been at this festival … ever. ‘John Peck Presente!’ as they say when they salute the dead in Central and South America.